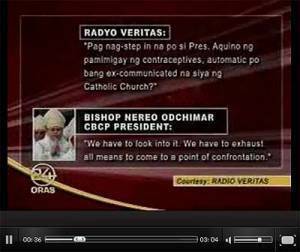 Bishop Nereo Odchimar, head of the Catholic Bishops' Conference of the Philippines (CBCP), denied reports that CBCP threatened to excommunicate President Benigno Simeon Aquino III for his views on artificial contraception, reports GMANews.TV. Says Odchimar, "I deny the news report aired in [a] TV network [Thursday] evening that I threatened President Aquino with excommunication in the interview with Radio Veritas." His disclaimer was posted on the CBCP website dated September 30. Click here to read the disclaimer. "It can be a possibility but I do not say that, right now, it is a proximate possibility," Odchimar also told Radio Veritas on Thursday. Click to watch the video on GMAnews.TV. Aquino, however, has not changed his position on artificial contracepcion. "My position has not changed. The state’s duty is to educate our families as to their responsibilities and to respect their decisions if they are in conformity to our laws," he said in a statement, as reported by GMANews.TV. Presidential spokesperson Edwin Lacierda maintained that Aquino is open to dialogue with the Catholic bishops. Excommunication from the Roman Catholic Church, according to newadvent.org, "deprives the guilty Christian of all participation in the common blessings of ecclesiastical society." The excommunicated person does not cease to be a Christian, but "his status before the Church is that of a stranger. He may not participate in public worship nor receive the Body of Christ or any of the sacraments. Moreover, if he be a cleric, he is forbidden to administer a sacred rite or to exercise an act of spiritual authority." According to newadvent.org, excommunication may come from the Pope of the general council for the entire church, from the provincial council or the Bishop for his diocese. A parish priest, however, cannot inflict or declare excommunication. Peron was excommunicated in 1955 after he signed a a decree ordering the expulsion of Argentine bishops Manuel Tato and Ramon Novoa. Luther was declared an outlaw in 1520 because he challenged the Roman Catholic Church’s teachings and taught that salvation can be received through faith in Jesus as redeemer. The Queen was excommunicated for her persecution of Roman Catholics in England in 1570. Excommunicated in 1431, the French warrior Joan of Arc was later recognized as a Saint and her excommunication was nullified. The King of Germany and Holy Roman Emperor, he was excommunicated due to a dispute Pope Gregory VII. German bishops ordered the excommunication of Nazi party members, including Hitler, in 1931. For more on this story, log on GMAnews.TV.